Unbeknown to many in Melbourne’s west, Vernon Street South Kingsville boasts one of the most eclectic and admired award winning costume jewellery designers, and art teachers in Australia. Anna Kolusniewski’s exquisite jewellery and bespoke garments draw upon years of training in silver-smithing, jewellery design and fine art. Her creations include vintage inspired bridal pieces through to metal costumes and roaring 20’s inspired designs for film and the stage; the meaning of Elysian is 'divine' and her pieces are exactly that. Recognised as one of Australia leading costume jewellery designers, her work is regularly represented in Fashion Week events, magazines and group exhibitions. 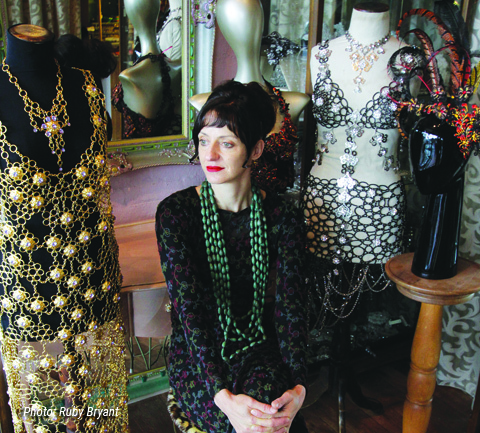 Her design interests have extended from costume jewellery to other areas including lead lighting, mosaic, sculpture, printing and fine art techniques, metal and theatrical costumes. Fifteen years ago Anna started teaching from her studio 'Aa is for Art', and now runs term based visual art and holiday programs for kids and workshops for adults, as well as teaching at other institutions also. Her work is on Instagram @aaisforart and @elysiancreations. As part of the Art and Industry Festival, Anna’s studio and workshop at 31 Vernon Street, South Kingsville will be open to children and adults, offering the opportunity to experience the design process, take part in an activity and view amazing costumes. A commissioned garment inspired by Two Birds Brewing, designed and made by Anna, will be showcased as part of Industrial Fashion which launches the Art and Industry Festival on Friday 16th November. This intricately made garment will be on display at Two Birds Brewing during the Festival.